“Did you know that San Salvario was the first truly multicultural area to spring up in Turin following the signing of the Statuto Albertina (the blueprint for the constitution of the unified kingdom of Italy) in 1848?” our Tour Guide, Silvia asked us. I know that it is certainly multi-ethnic today, attracting visitors to often choose this as their base from which to explore the city. But, I had no idea that this could be traced back to Carlo Alberto of Savoy’s Statuto Albertina which had first given the residents of this ‘new’ quarter the freedom to choose their own religion and so led to many different churches springing up around the area. For the recent German Bloggers Tour of Turin, we met our hosts Chiara and Silvia post breakfast in the lobby of the hotel in Corso Vittorio Emanuele II – located conveniently next to Porta Nuova train station and also dead handy for the metro. Note to anyone thinking of visiting the city in 2015! However, we weren’t going anywhere near trains today…..Actually, how could we possibly start the tour without an espresso?!!!!! I had just the evening before read an article in an online travel magazine in which the journalist is told that in Turin the first cup of espresso is to wake up, the second is then to experience the taste. We asked our guide Silvia if this was really the case. “Yes,” she confirmed solemnly. “Although the function of the second one is probably more to make sure that your eyes actually stay open…!”, she quipped. It was Saturday morning though, the sun was shining and there wasn’t a cloud in the sky. We were fully awake even without espresso!!! We laid our maps out on the coffee table in the lobby and Chiara pointed out our route for the morning. 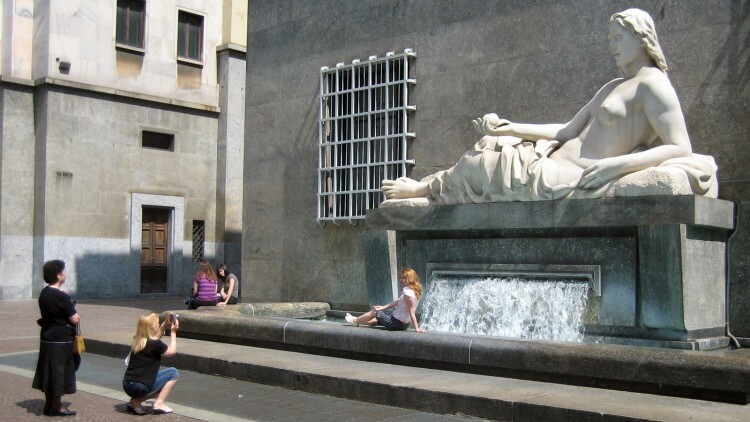 Our first port of call on our blog tour would be Turin’s historical centre. “I’m trying to get an idea of how big Turin is…” said Sabine – one of the German bloggers. “Well,….see our route.” Chiara was tracing the route again with her forefinger. “Going up straight from Porta Nuova to Piazza della Repubblica, where the famous outdoor produce market is, takes about 10 minutes on foot. It’s really not far. The historical centre is really compact and idea for walking,” she explained. “But we’re not going to be going straight up via Roma today. 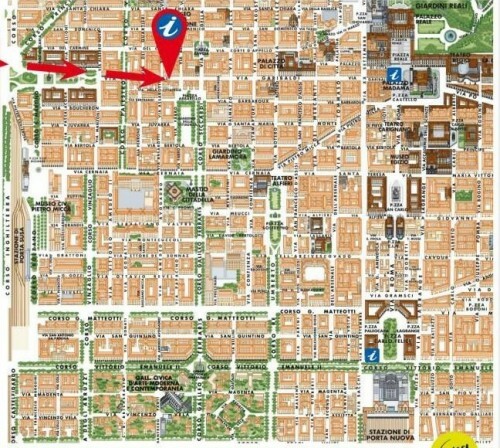 What we will do today is make our way through some of the interesting streets and piazzas such as via Lagrange, piazza CLN, piazza San Carlo, round to the Egyptian museum (Museo Egizio), piazza Carignano and Palazzo Carignano… “So, are we all ready?” We stroll outside into the sunlight, squinting as we take in the surrounding buildings and make our way up via Lagrange, past the shops a number of photo opportunities and into piazza CLN. “I’m really amazed at how beautiful the architecture is,” marvels Soraya. Silvia points out the dividing line of via Roma at the point of piazza CLN. “Here you can clearly see how via Roma has two completely different faces: baroque meets rationalist”. She explained that in the 30s Mussolini wasn’t actually that popular in Turin. The Savoy royal family had been very popular here and after that there was the Agnelli who filled the gap. In order to make himself more appealing to the local population Mussolini decided to leave an architectural imprint of the city that would be permanent. The straight, smooth rationalist lines of the buildings and colonnades in this section of street are both majestic and imposing. It is impossible not to be impressed. Silvia also explained that the pillars holding up the colonnades in the first section below piazza CLN are a nod to their Baroque cousins in the section leading towards piazza Castello. 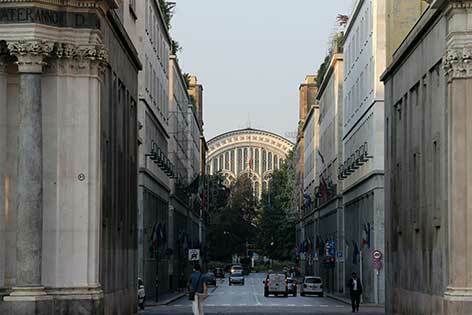 There the Baroque lines are rounded and smooth unlike the sharper rationalist edges and corners of the smooth pillars lining the road back towards Porta Nuova. As we walk into piazza San Carlo, Silvia is explaining to us how this has been dubbed locally as ‘the drawing room’ of the city due to the plentiful concentration of historical cafes, chocolatiers and pastry shops in the area. 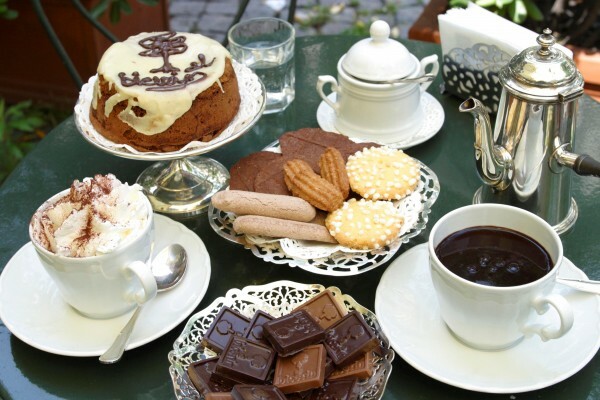 It’s a coffee drinker’s and chocoholic’s dream – paradise for anyone with a sweet tooth. You will be spoilt for choice. The space originally intended for the metro has instead the honour of being the longest underground car park in Europe stretching from piazza Castello to piazza Carlo Felice. Sounds too good to be true! If you want to go down there as a pedestrian, you can also see some old Roman ruins sections of the old drainage system from Roman times. It really is fascinating. 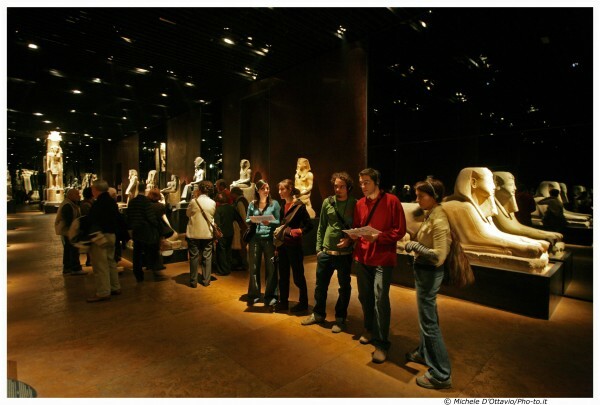 The bloggers were suitably impressed Going round from piazza San Carlo to the Egyptian museum (Museo Egizio), Silvia explains that it will be opening its doors to a whole new floor and a ‘never-been-seen-before’ collection of Egyptian artefacts after a few years of renovations. The Galleria Sabauda Royal art collection used to be on the top floor where the new collection will be but now the art collection has been transferred to Polo Reale. Silvia explains that the Egyptian museum is able to expand its collection because It had so many pieces tucked away in storage chambers underground and now those pieces are going to be on display for the first time from 1st April 2015. There’ll also be a new cafe and bookshop too. Hope the cafe is going to be run by someone famous!! !We have to wait and see. Moving into piazza Carignano we face the fabulous Palazzo Carignano which houses the first Italian parliament and is something not to be missed when you come to visit. Originally it was built as a family home for the Carignanos but later became the political hub from which Conte Camillo di Cavour used to shout his lunch order from the front balcony across to Il Cambio. He was also prone to people watching from the front window of the restaurant, it is said, so that he could check on comings and goings at the parliament. At this point it’s time for refreshments and we stop off for gelato at Gelateria Pepino, Turin’s famous gelateria and inventor of the “Pinguino” chocolate covered gelato on a stick. Yes, we know that in Italy, you don’t eat gelato before lunch – but what else could we do? We were right there. It was right under our nose and you can’t pass through piazza Carignano without stopping at Pepino. We might not have had the chance again all weekend!!! We hope you enjoyed our travel blogger tour of Turin. For more inspiration and things to see and do around Turin, check out our Top 10 Turin section. See http://www.torinoincontraberlino.it for information about Berlin inspired events in Turin throughout 2015.